Unique names, such as the Buffalo Bisons, have a long and venerated history throughout the entirety of Minor League Baseball. Minor League Baseball teams have long employed unique names. In some cases, these names predate the 1901 formation of Minor League Baseball itself. But what Minor League team names have the deepest roots? This article attempts to answer that question. Each of the 10 teams on the list below currently employ the name in question, though they may have not done so consecutively since its initial occurrence. The first professional team in Buffalo was named the Bisons. From 1879 through 1886 this team was a member of the National League. The "Bisons" persisted in various iterations through 1970, when the International League franchise relocated to Winnipeg. Minor League Baseball returned to the city in 1979, in the form of a Double-A Eastern League team. Since 1988, the Bisons have been members of the Triple-A International League. They are currently affiliated with their neighbors to the north, the Toronto Blue Jays. Like Buffalo and the Bisons, "Lookouts" is the only professional baseball team name that the city of Chattanooga has ever known. (The name, of course, is a reference to the nearby Lookout Mountain). The team debuted in 1885 as a member of an early iteration of the Southern League. The Lookouts gained particular renown under the leadership of Joe Engel, a Veeckian showman who, perhaps most notably, recruited 17-year-old Jackie Mitchell to pitch against a barnstorming New York Yankees team in 1931. The Lookouts, Double-A affiliate of the Minnesota Twins, have played in the Southern League consecutively since 1976. Toledo native Jamie Farr made the Mud Hens an internationally known name during the 1970s, as his Maxwell Klinger character regularly wore the team's hat and jersey in episodes of M*A*S*H. But the Mud Hens had plenty of history before this improbable breakthrough. The Mud Hens name was first used informally, in reference to the birds who inhabited the marshland located near Bay View Park. The first team officially named the Mud Hens debuted in 1896. The city went without a team from 1956 through 1964. The current iteration of the Mud Hens has played in the International League since 1965. 2018 marks their 32nd consecutive season as the Detroit Tigers' Triple-A affiliate. As the Travelers note on their web site, they have "failed to field a team in only seven years since 1901, with the last absence coming in 1962." In that 117-year period they have played as a member of five different leagues; 2018 marks their 52nd consecutive season within the Double-A Texas League. "Travelers" is a reference to the folk song "The Arkansas Traveler." The team initially went by the name of Little Rock Travelers; in 1957 they switched to the Arkansas Travelers. In the process, they became the first professional sports team to name itself after a state. The Travelers are currently the Double-A affiliate of the Seattle Mariners. A case could be made for the Barons to appear higher on this list, as Birmingham fielded a team named "The Coal Barons" beginning in 1885. The "Barons" name debuted in 1901, and from that season through 1961 the Barons competed in the Southern Association (a precursor to today's Southern League). In 1981, after five seasons without Minor League Baseball, the Barons joined the Southern League, and there they have remained. The team has served as the Double-A affiliate of the Chicago White Sox since 1986. Indianapolis' use of "Indians" as a moniker predates the 1915 establishment of the Major League Cleveland Indians. As such, this Triple-A entity can claim to have the longest-running consecutive usage of a unique team name in all of Minor League Baseball. Since 1902, the Indians have played as a member of the American Association, Pacific Coast League and, since 1998, the International League. They were purchased by the Cleveland Indians in 1952, an arrangement that lasted four seasons. Since 2005, Indianapolis has served as the Triple-A affiliate of the Pittsburgh Pirates. The Spokane Indians debuted in 1903, one year after the appearance of the first Indianapolis Indians squad. The team has played within the Class A Short-Season Northwest League since 1983 and are currently an affiliate of the Texas Rangers. In recent seasons, Spokane has partnered with the local Spokane Indian tribe. Team uniforms and ballpark signage features the tribe's Salish language script. Indianapolis and Spokane are the only Minor League teams who share a name with a Major League team while not being affiliated with the MLB team in question. The 1988 film Bull Durham made the Durham Bulls a household name. By this point, the enduring moniker already had 75 years of history under its belt. The first Bulls team debuted on April 24, 1913, as a member of the North Carolina State League and went on to play in the Carolina League from 1945 through 1971 and again from 1980 through 1997. 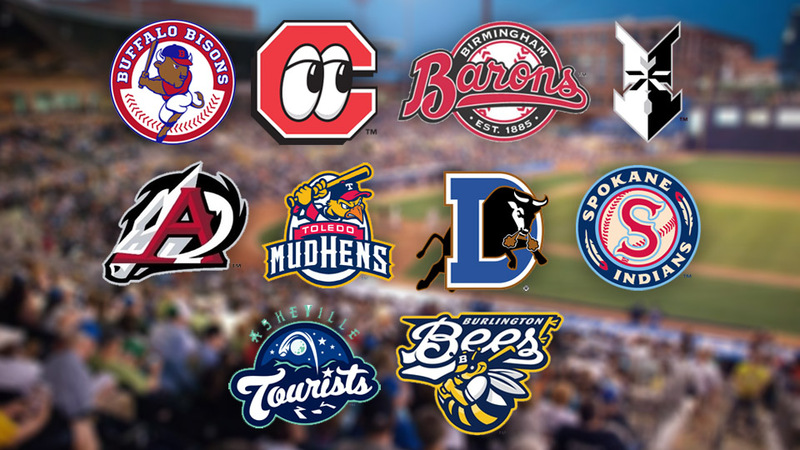 The Bulls switched to the Triple-A International League in 1998, a shift that was due in part to the team's increased popularity in the wake of Bull Durham. As was the case with the Mud Hens, the Tourists name was originally used informally. Specifically, it referred to the fact that many of the players with the Asheville Mountaineers baseball team weren't from Asheville and, hence, tourists. The name became official in 1915 and was used throughout the 1971 campaign. After a four-season stint as the Asheville Orioles, the Tourists name returned in 1976. Since 1980 the team has played in the South Atlantic League; since 1994 they have served as the Class A affiliate of the Colorado Rockies. When Salt Lake entered the Pacific Coast League in 1915, it was as the Bees. This, of course, was a fitting moniker for a team that played in the Beehive State. "Bees" was the name that was predominantly used in Salt Lake through the ensuing decades, though the team also was know as the Giants, Angels and Gulls before relocating to Calgary following the 1984 season. When PCL baseball returned to Salt Lake in 1994, the team was known by the Bee-themed names of Buzz (1994-2000) and Stingers (2001-05). In 2006, the team switched back to the original Bees name. Baseball in Burlington, Iowa, began in 1889 with the inception of the wonderfully named Burlington Babies. The first team named the Bees appeared in 1924, as a member of the Mississippi Valley League. That moniker was consistently used throughout the 1981 campaign. After a period in which the team was named for its Major League affiliate, the Bees name was reinstituted in 1993. The Bees have been a member of the Midwest League since 1962 and are currently the Class A affiliate of the Angels. - The Rochester Red Wings have operated continuously since 1889 and employed the Red Wings name in every season since 1928. - In San Antonio, the "Missions" name was first utilized in 1933. - The Syracuse Chiefs first employed their moniker in 1934. Meanwhile, the first team named the Peoria Chiefs debuted in 1953. - The California League's Stockton Ports played their first season in 1946. - The Billings Mustangs, founded in 1948, have used the Mustangs name for every season of their existence. - The Eugene Emeralds played their first season in 1955. They have always been named the Emeralds. - The Norfolk Tides' name dates back to the Tidewater Tides of 1961. - After two seasons as the Lafayette Drillers, the franchise moved to Tulsa in 1977. The Drillers name has been used throughout that time. - This offseason, the Tampa Yankees changed their name to the Tarpons. This name hearkens back to a Florida State League franchise that had existed from 1957 through 1987.